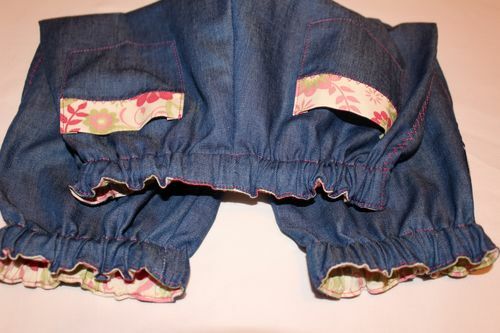 The summer clothes for kids have to be practical, easy and beautiful. And to sew such clothes to independently absolutely simply even beginning skilled workers. 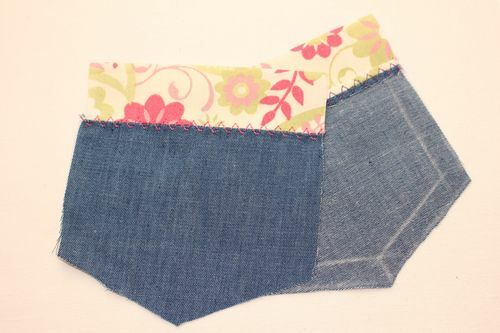 Our master class contains a pattern and in detail describes how to sew easy summer trousers from denim and cotton for the little princess. 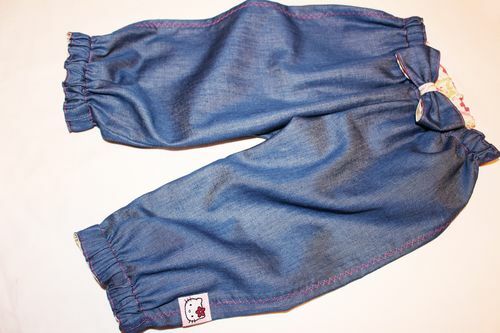 The pattern is calculated on age of 1,5-2 years and height of 86-92 cm the Model differs in ease and a practicality. 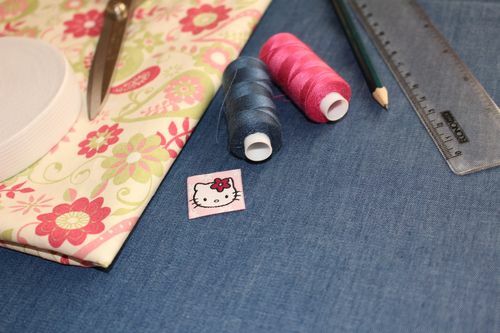 The fashionable accent to jeans is added by a stitching from color cotton fabric. For a start it is necessary to unpack a pattern without fields on a sheet A4, to cut out and stick together all necessary details. 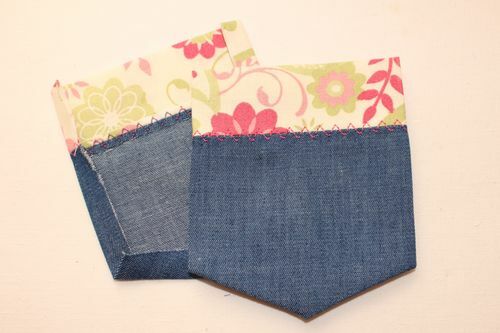 Now we will fold denim double along an edge and we will pin a pattern. 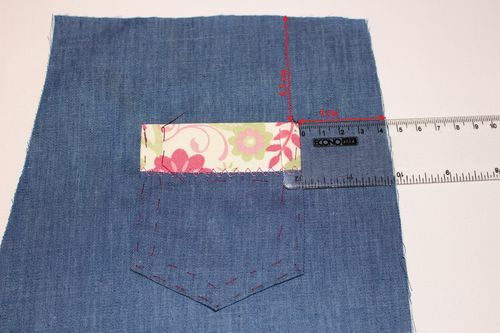 Then we will increase length of trouser-legs by 15 cm, as by a photo. 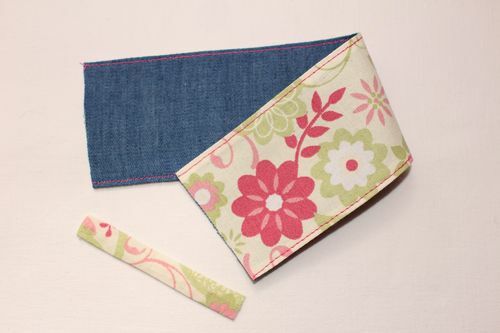 We cut out details with allowances of 1 cm on all seams. 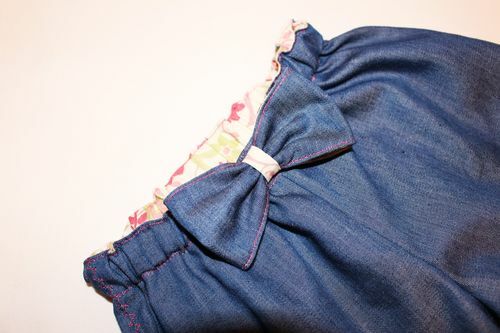 Let's find from denim 2 lower details of hip-pockets with allowances of 1 cm and one detail of a bow of 7 cm by 20 cm in size. 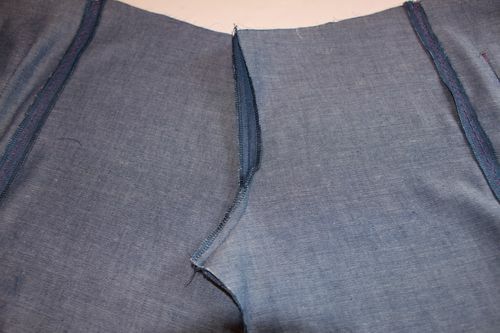 From cotton we will find the following cross details: turning of a belt of 63 cm by 4,5 cm in size, 2 turnings of trouser-legs 35 cm by 4,5 cm, 2 top details with a hip-pocket bend, adding on allowances 1 cm, bow at 20 cm and 3 cm by 7 cm in size 7sm details. 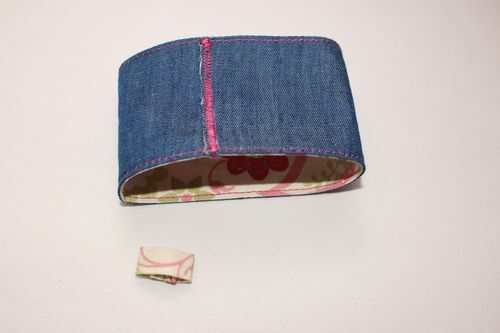 We sew hip-pockets, razutyuzhivay allowances and through grinding we will lay a decorative line a bright pink thread. We will cut off excess allowances. 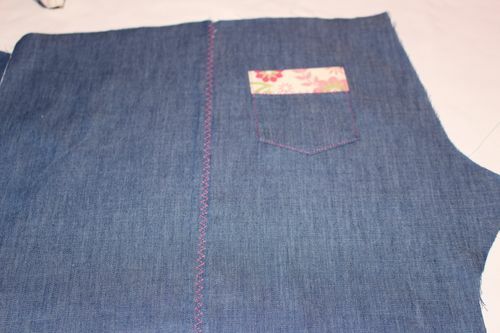 Let's iron allowances on perimeter of ready pockets for seamy side. 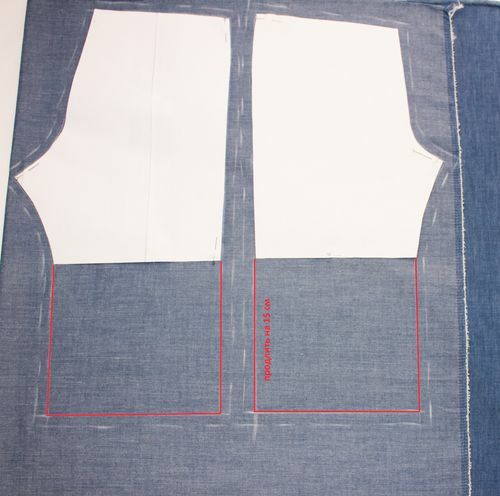 On back part of trousers we will symmetrically tack pockets at distance of 6,5 cm from the top cut and 4 cm from a lateral seam. Pristrochy their contrast thread, having receded from each edge of 2 mm. 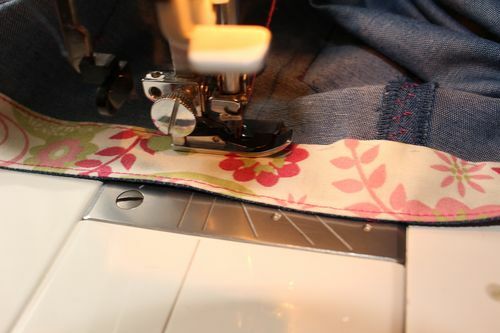 Let's lay a line on lateral seams on the sewing machine, we will sweep off each edge separately by means of an overlok and we will smooth allowances. 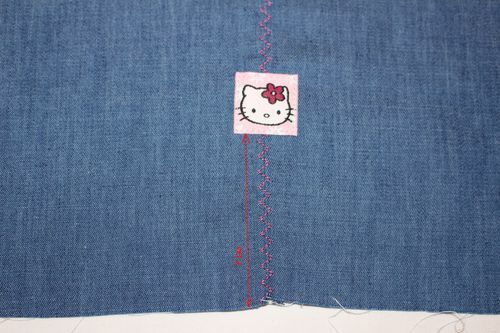 From the face on a seam of grinding it is feasible a decorative stitching a pink thread. 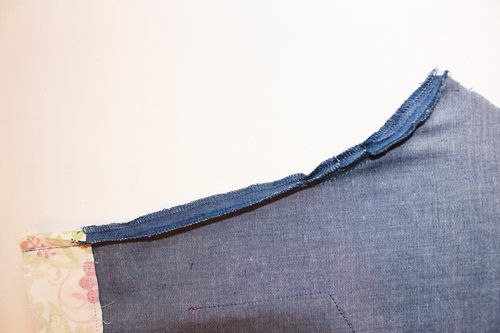 Having receded 7 cm from bottom edge of one trouser-leg, on a lateral seam pristrochy a stripe. We sew turnings from cotton to bottom edges of trousers, allowances about 3 mm are cut off and we smooth down them on the party of trouser-legs. Then the free cut of turning 1 cm wide is ironed on seamy side. We grind off a forward average seam of trousers. Each cut is swept separately off on an overloka and we steam. On a circle surely we do notches. Turning of a belt it is sewn similar to a bottom of trousers, we cut off allowances to 3 mm and we smooth down on the jeans party. 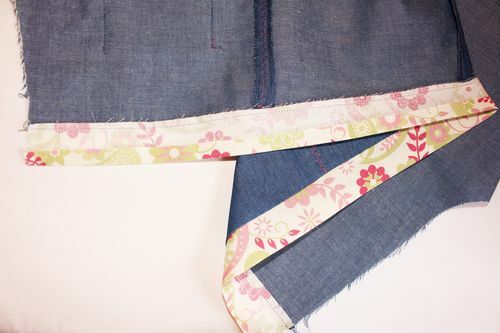 We carry out an average back seam. Let's make on notch allowances, we will sweep off on an overloka and we will iron the iron. 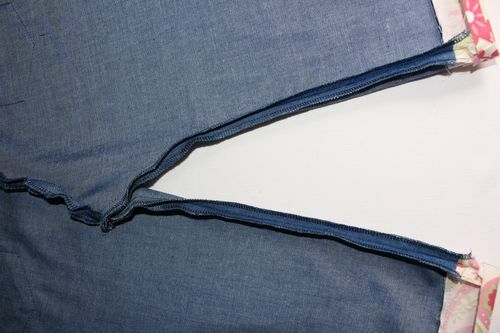 By uniform line it is sewed step seams, we sweep off cuts and we smooth them. Then we turn off turnings of a bottom of trousers and a belt on seamy side and otstrachivay at distance of 2 mm from each edge contrast bright pink threads. We leave open a piece of 3 cm for threading of an elastic band. 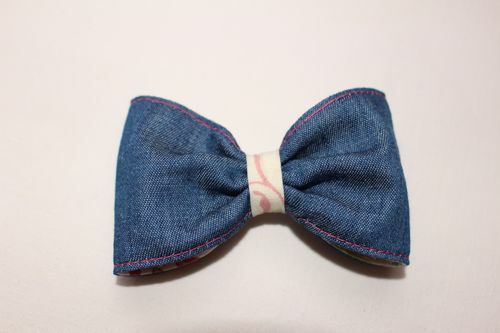 We sew bow details from cotton and denim together on the long parties, allowances about 3 mm are cut off. 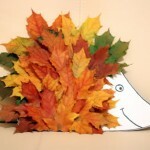 Then the bow needs to be turned out on the person and a bright thread to otstrochit on the long parties. To curtail a small detail of bank twice lengthways, to sostrochit and turn out on the person. We will well steam each detail of a bow. We sew each part of a bow in a ring. 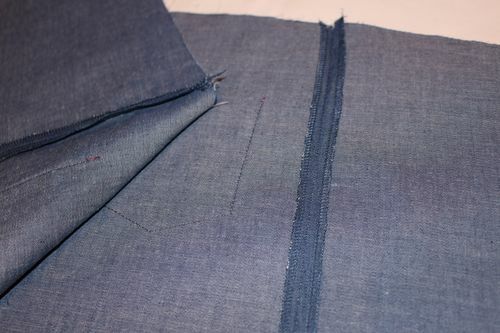 For more flat seam it is worth using a dense zigzag. 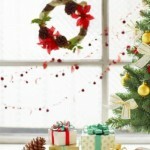 We pass a big ring in small and we straighten it that the beautiful bow turned out. 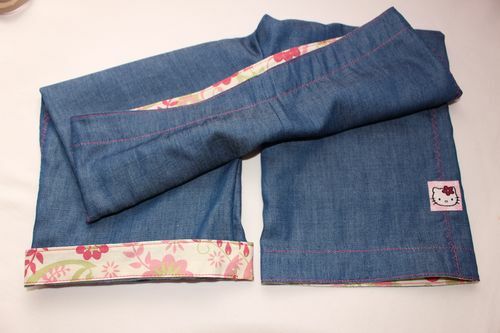 We insert elastic bands into cuffs and a belt of trousers. 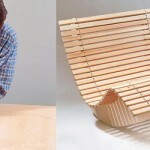 The belt requires an elastic band of 40 cm, and for cuffs on 22 cm. 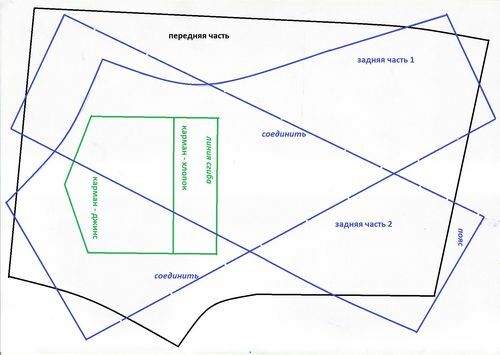 Open sites zastrachivay. 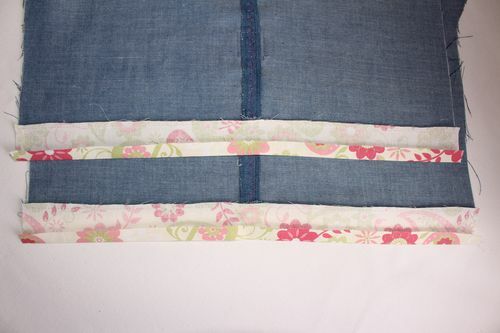 We sew a bow on a belt on the center. 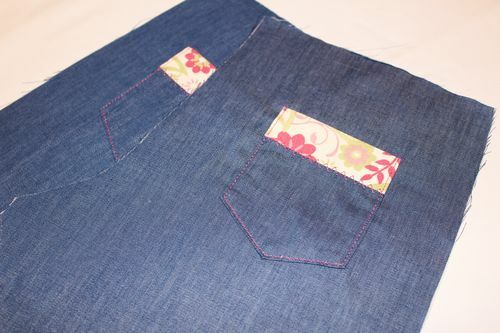 Easy summer jeans for the girl - are ready! Carry with pleasure!